Graham Denton is a poet and anthologist, whose latest collection, My Cat is In Love with the Goldfish was published by A&C Black last month. He also runs a small press, Hands Up Books, which is the only independent press in the UK that focusses solely on poetry for children. HOW LONG HAVE YOU BEEN A “POEMIST”? A child at my son’s school asked me this. I love that word, “poemist.” Children can often be much more inventive with language than adults. I was once in a classroom, and wrote the line “A bird went over the trees…” on the whiteboard. I asked the class for a better word than “went” and a boy shouted out “jumped”. I’d never have thought of that. Imagine it: a bird that jumped! Well, I did, a bit later, and came up with the idea for a poem about a Kangarooster. The poem isn’t finished yet. But I use this as an example of how ideas can spring from simply looking at things in fresh and original ways. Which is a gift children possess. HAVE YOU ALWAYS WANTED TO BE A POET? A long, long time ago when dinosaurs still roamed the earth and I was a very young boy, I dreamed, both night and day, of being a professional footballer. Football was a passion of mine, and still is. But for one reason or another, I put that dream to bed. I did always enjoy playing with words from an early age, too, so maybe somewhere at the back of mind being a poet was there, as something I could possibly do when I grew up. Like footballers, poets possess a lot of skills – words are like footballs; only poets have far more than one to play with at any one time. Football’s watched by a lot more people, of course, and footballers get paid much, much more than poets do, but overall, I think I made the right career choice. WHAT DO YOU LIKE ABOUT BEING A POET? What’s not to like! You can “be a poet” whenever and wherever you want. All you really need is a pen and paper, a healthy helping of imagination and a decent vocabulary. And you can do it for as long as you like. There is no retirement age for poets! But you do have to work hard at your writing – there’s no getting away from that. 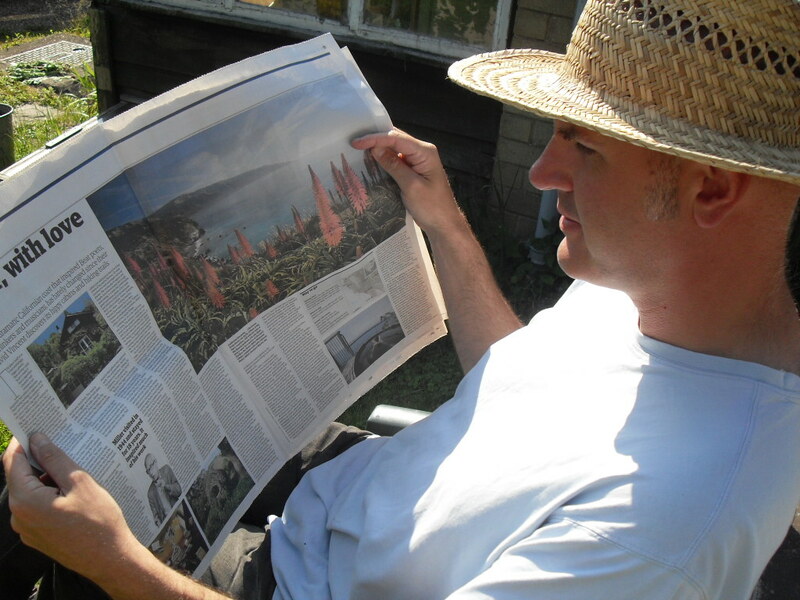 As well as working on his writing, Graham spends time Garden Gazing! WHERE DID YOU GO TO LEARN TO BE A POET? Well, after school, I went to loony-versity, which was where I learned how to pen all sorts of silly rhymes. At school, there was only the one Head, but at loony-versity, there were Heads galore: air-heads, mutton-heads, block-heads, knuckle-heads, bone-heads, jug-heads, dunder-heads, lunk-heads, meat-heads, pin-heads, fat-heads…thin-heads (thin heads? Not sure about that last one – I suspect I was just looking for a rhyme with pin-heads. Sorry.) The truth is, you don’t need to take any test or get a qualification to be a poet. You learn to be a poet by practice – by writing, writing, writing, so that it becomes almost second-nature. Practice doesn’t always make perfect, but when it does and you’ve written a poem that you feel you cannot improve any further, then there is no finer feeling. I used to buy them online, off eBay, but I realised they were second-hand, so I stopped. I form my own ideas now – it’s a lot cheaper, far more satisfying, and generally they’re quite original. I get them from everywhere: things I see, hear, smell, touch, taste, remember, experience, read about, or simply just imagine. Poetry is the ability to see things in a new way, and transform those things into words. Or it’s the ability to transform things into words so that you see in a new way. It can work both ways. Once you really start looking, everything becomes a possible subject for poetry. Humans have this wonderful gift – the gift of language, which allows us to verbalise our thoughts and feelings – that separates us from all the other animals on Earth. It seems a great shame to waste it. WHAT ARE YOUR FAVOURITE KINDS OF POEM? Any poem that makes me see something from a fresh angle, or describes something perfectly with words that I might have only seen in my mind’s eye. Or a poem that gets my chuckle muscles working or my brain ticking, or pricks my consciousness or sends tingles down my spine or makes my heart as light as a kite in flight. Poems can do all of these things. Not all at once, you understand, unless they’re multi-tasking poems. Some of my very favourite poems are the shortest ones. Sometimes the smallest stone can make the widest ripples – you can say more in, say, ten words than you can in an entire novel! Short poems are certainly easier to remember. There’s even a poem, “Ode to the Invisible Man“ by Colin McNaughton, that has no words whatsoever! Now there’s poem you’re not likely to forget in a hurry! Have fun with language, and playing with words. Finding the right word is, as the late American poet Eve Merriam said, like “having a tiny marble in your pocket, you can just feel it.” Always strive for the right words. Sometimes those ‘right words’ might even be ones you’ve invented yourself. Lewis Carroll, the author of Alice in Wonderland, often used to squeeze and squash two words together – ‘snort’ and ‘chuckle’ became ‘chortle’ which is now a word that’s become common usage in the English language. Poets have something called a poetic license, which allows them to do whatever they want with words. Make your own poetic licence (just include your name and perhaps a few favourite sayings) and you’re away! Carry it around with you wherever you go. Above all else, enjoy what you’re doing. Happy writing! 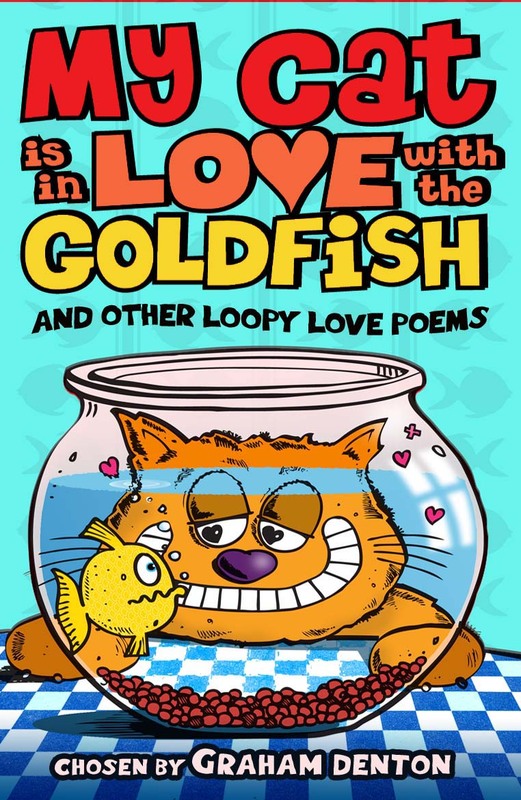 My Cat is In Love with the Goldfish can be bought online at http://www.acblack.com , www.amazon.co.uk, and various other online bookstores. Thanks Graham for a fabulous interview – lots of great tips and a fabulous insight into being a poemist! Great interview – bet there were plenty of laughs! 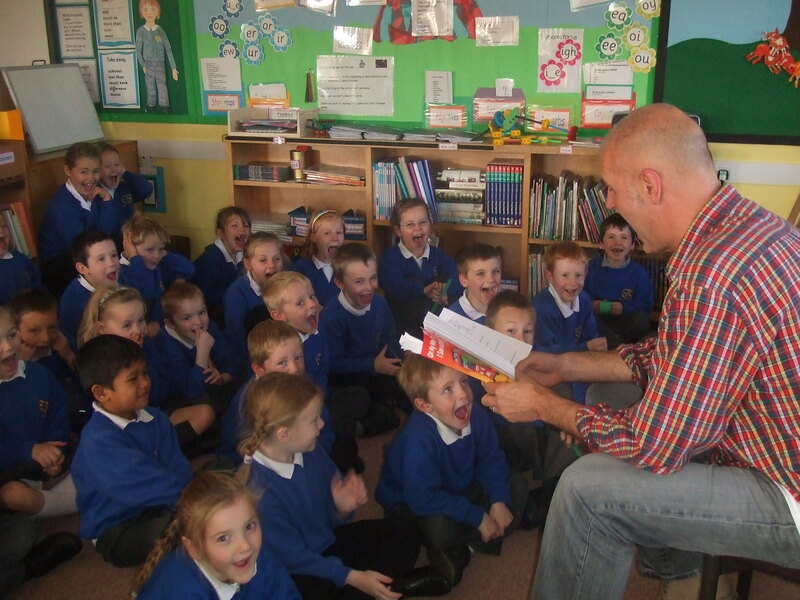 I think Graham’s workshops are great fun!